The Salvaged Cabin finish aptly describes the reclaimed wood look of the top and four open shelves of this bookcase. Accent your home office or any other living space in your home with this storage and display piece. 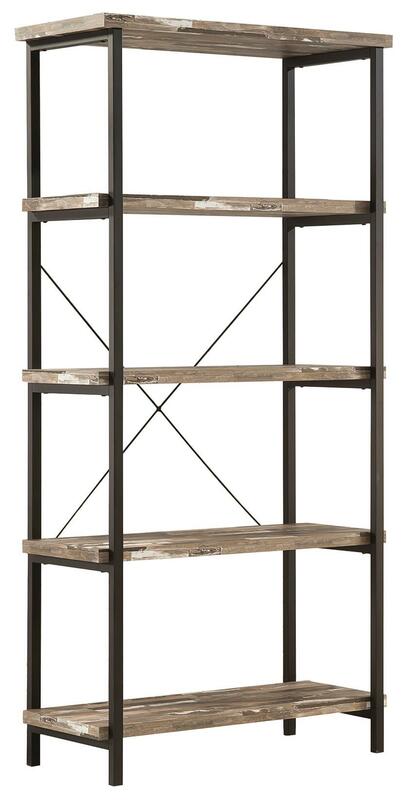 The Skelton Modern Rustic Bookcase with Metal Frame and Distressed Finish Shelves by Coaster from Nashco Furniture - Nashville. We proudly serve the Nashville, Franklin, Brentwood, Clarksville, Green Hills, Davidson County, Williamson County, Tennessee area. Product availability may vary. Contact us for the most current availability on this product. Construction: Case Metal in black finish. 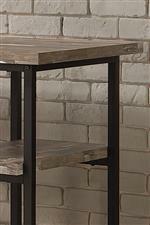 Tops and shelves in distressed salvaged cabin finish. The Skelton collection is a great option if you are looking for Relaxed Vintage furniture in the Nashville, Franklin, Brentwood, Clarksville, Green Hills, Davidson County, Williamson County, Tennessee area.